Morning radar shows an area of light rain moving over the metro. 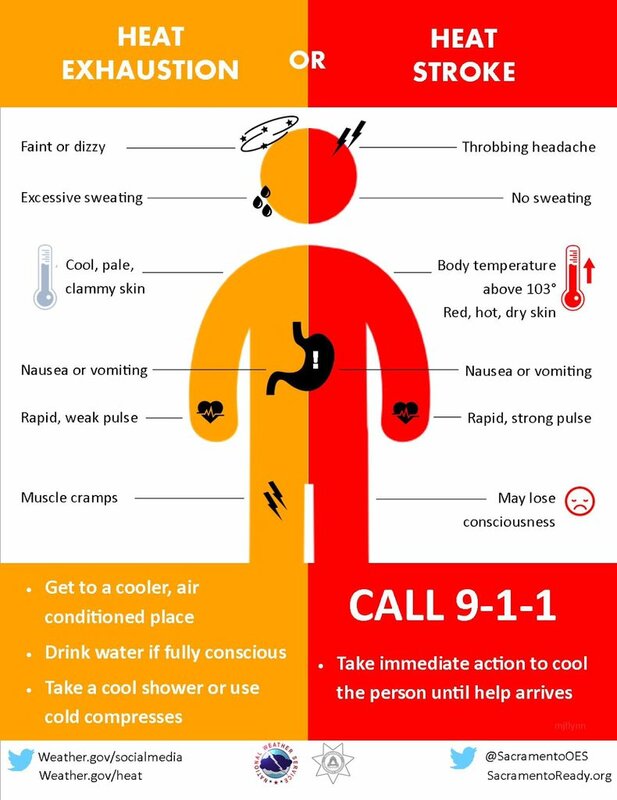 As of earlier this morning, the prediction was for temperatures to reach the 96-98° range this afternoon with sauna-like humidity levels, resulting in heat indices of 110°+. That prompted the issuance of an Excessive Heat Warning for counties along the MS River (dark pink shading on the map below) and a Heat Advisory for Fayette and Marshall Counties in the metro (orange shading). 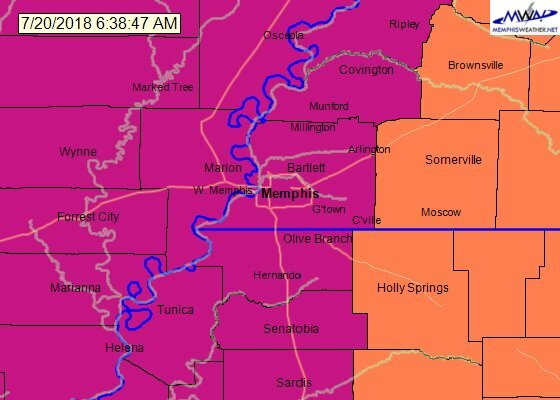 Excessive Heat Warning in pink. Heat Advisory in orange. Given this morning's "fly in the ointment," we may not quite see values as high as predicted, but we're basically quibbling over Grand Champion and Reserve Grand Champion barbecue at Memphis in May here... it's gonna be very hot and very humid this afternoon, to dangerous levels! 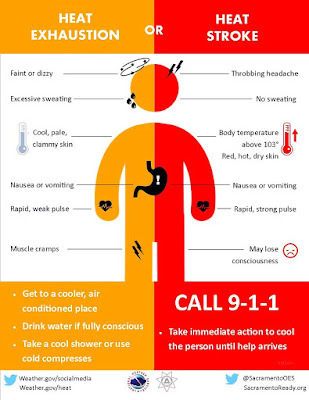 Practice good heat safety and avoid the outdoors if you can. If you can't take more breaks and drink more water than you think you need. Heat Exhaustion is no laughing matter. It's not unusual (as we have seen lately) for scattered storms to form in the summertime and pose threats of gusty wind, a bit of hail, lightning and heavy rain in spots. What is more unusual is the atmospheric setup for the Tennessee/Ohio Valleys into the Mid-South today and tonight. The risk of organized, more widespread severe weather is elevated across the region, particularly this evening with all of those threats higher than usual in the summer. You can thank a digging trough of low pressure at the mid and upper levels of the atmosphere to our northeast, an unusually strong mid-level jet stream moving into the region, and the excessive heat and humidity at the surface for creating ideal conditions for the development of strong to severe storms to our north that will move into the region later today. As far as threats are concerned, they include large hail (some up to 2"), damaging wind to 60-70 mph, copious lightning, very heavy rain, and an isolated tornado threat. 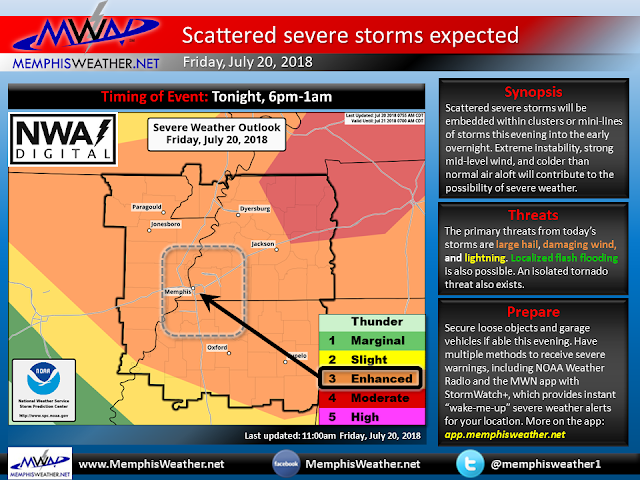 The higher probability of severe weather looks to be to our northeast (northeast of Jackson, TN), but we are still in an Enhanced Risk, or level 3 out of 5. Summertime Enhanced Risk areas in our region are not common, so this is an event to stay tuned in to. If I were you, I would be most concerned about hail and wind. Timing is the bigger question mark for multiple reasons, but primarily because it could be different times for different areas in the metro. The storms should take the form of clusters or mini-lines, which will affect some people and not others. I do NOT expect a massive squall line that affects everyone nearly the same. You should be prepared for the possibility of severe weather starting around rush hour and continuing through at least midnight. The most likely time for the strongest storms appears to be about 7pm-12am, but storms are possible both before and after that time. In addition, showers and rumbles of thunder could continue throughout the night, but the severe weather threat drops significantly after about midnight. The big question that still lingers is whether the extreme levels of instability forecast by the models is unrealized due to the late morning showers and cloud cover. Even if it doesn't get as unstable as forecast, I still expect that it will be more than sufficient for strong to severe storms this evening. Have your severe weather safety plans dusted off. If you are able to garage vehicles this evening and overnight, it would be a good idea. Secure all loose outdoor objects. And of course, have multiple ways to receive severe weather warnings. 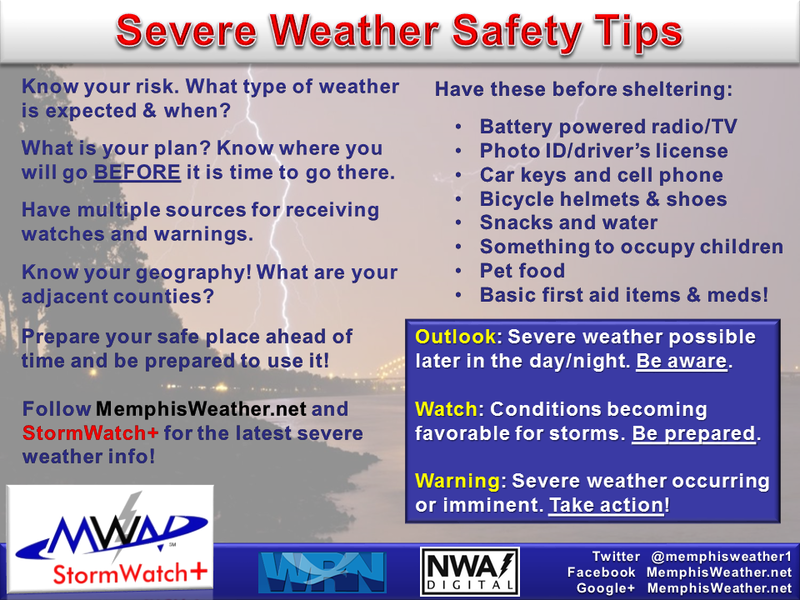 StormWatch+ in the MemphisWeather.net app is our #1 recommendation, paired with a weather radio and local TV outlets. We'll also bring you the latest on our Facebook and Twitter feeds. Links to all are below. Remember, a watch issuance means that conditions are favorable for the development of severe storms - and I expect one. It may be a tornado watch if it includes areas that have a slightly higher chance of that (our threat for tornadoes is very low, but not zero). A warning means it is time to take action. Heed them all. After a few morning showers move out Saturday morning, conditions improve quite a bit. Rain chances will be gone through at least Tuesday if not longer, and, in the wake of a front early Saturday, dewpoints and temperatures will also start to recede a bit. It will still feel like summer, but heat indices of 100 or less should be much more tolerable this weekend and into early next week as highs top out near 90.